Google has recently started to update their Play Store with a new feature called Google Play Protect. The feature is available on Android phones and also in the Play Store. Google Play Protect will scan all apps in the Play Store frequently to make sure that they are safe for people to download. It will also show you whether an application is safe to download by displaying the message “Verified by Google” just below the download progress bar. Most of us have a smartphone and chances are that you download applications from different sources. Luckily, Google Play Protect also scans your device to make sure that the apps you have installed are safe. The feature will be automatically turned on and will scan without the need for extra settings. You do have the option to manually start a scan. Just open your Play Store, navigate to the menu section and locate the “My apps & games” section. From there you can start the scan and also see if there are any problems that were found from previous scans. If you’d like to switch it off, there’s a new section on the Play Store menu which is labelled “Play Protect” where you can switch it off. Though I’m not sure why you’d want to do that. With the recent uptake of use of mobile phones and apps, security on these devices has become important. Any app that is distributed through the Google Play Store is tested for safety before it is even placed there. 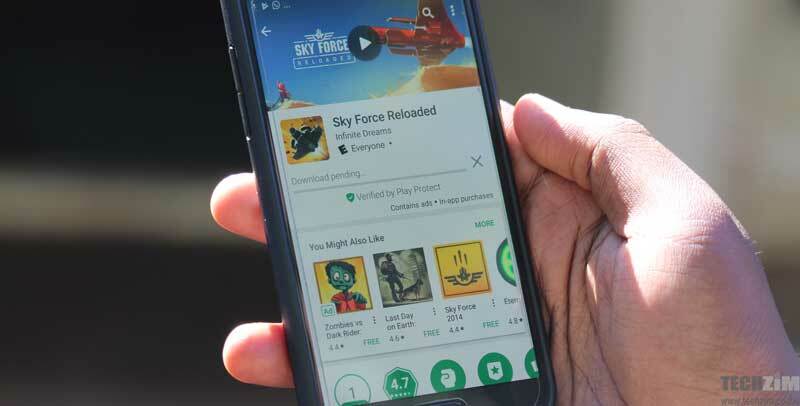 The problem was that some people would make an app without any virus or malicious code to make sure it gets on the Play Store for the first time. Now after the first submission of an application, it is still tested for safety before a new version is submitted. However, sometimes, developers can send updates to their application without directly submitting the app to the Play Store. Even if they go through the Play Store, the harmful code may be hidden so well that Google Play Store will not detect it. It has happened before, that’s why we’ve seen over 800 apps on the Play Store containing harmful code. Yes that number is small compared to the billions of apps available on the Play Store. But all it takes is just one of those apps to make it’s way to your phone and take control of your device or worse just wipe out your data. You might think it’s far fetched but people install a lot of apps and sometimes people just do it without even taking a look at who has made the app. Google Play Protect aims to remove all those hidden small worries for people. Now you can at least have comfort in knowing that Google is actively scanning over 50 billion apps daily and letting you know if it is safe before you download. And if you’re the type of person who installs from other Play Store, then Google Play Protect still has your back. Given how some people actually download cracked versions of their favorite app in order to access premium features. It’s good that Google Play Protect does the device scanning because some just agree to install from unknown sources even if their phone warns them. It always works continuously so you’re kind of always protected. Do you think that this service is solving an a problem for you or it’s just yet another convenient thing that you could do without? Is there more that could be done to improve security when downloading apps.